Is it a whale? A dolphin? Or perhaps just a large monstrous sea animal? Well, we’re not entirely sure yet and people from the Philippines don't seem to be certain either. 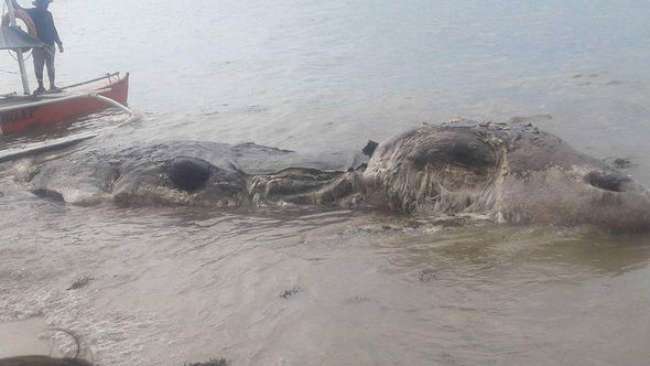 A 9.7-meter-long (32-foot-long) sea creature was randomly discovered lying on a beach in Maasin City on Leyte island. Authorities from the Bureau of Fisheries and Aquatic Resources are still struggling to identify the species. Guesses of a whale have been made, but Julius Alpino, from the Bureau of Fisheries and Aquatic Resources, shared that it was difficult to say due to the rotten state of the animal. Nujnuj Capistrano documented part of the saga by taking numerous photos of the creature. Capistrano said: “I was just passing by the beach and took some photos but I don’t know about the details. Capistrano said that the creature was dead when he witnessed (and smelled) the discovery. This isn’t the first time the Philippines have encountered this type of situation. Earlier this year in February, a white “globster” that was 6 meters (20 feet) long was also found by the shore. Lucy Babey, head of science and conversation for the animal charity Orca, told the BBC: "It's definitely a very decomposed sea creature in the later stages of decomposition." She went on to suggest that it could indeed be a whale, adding that there are quite a few whale species in the Phillipines. Babey also pointed out that 10 percent of whales and dolphins that die out in the sea end up by the shore.